Adult Asian citrus psyllid, Diaphorina citri, (2-3 millimeters long) on a young citrus leaf. It’s nasty. It’s mean. It’s killing citrus crops, and it’s giving the Florida citrus industry quite a scare! 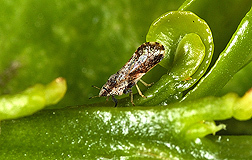 The Asian citrus psyllid, Diaphorina citri, is the insect carrier of the deadly citrus greening bacterial disease also known as “Huanglongbing,” or HLB. The 2- to 3-millimeter-long, brown-colored psyllid was first spotted in Florida in June 1998, and the HLB disease it carries was found there 7 years later, in late August 2005. Now HLB is attacking various kinds of Florida citrus—causing yellow shoots, mottled leaves, and vein-phloem degeneration from Candidatus Liberibacter asiaticus, the bacterium carried by the psyllid. Present for many years throughout most of Southeast Asia, southern Africa, Réunion Island, and Mauritius, HLB was first found in the New World in Brazil during 2004. Trees infected by the disease may live only 5 to 8 years, during which time they produce unmarketable, misshapen fruit with an acid and bitter taste. With both the HLB vector and disease now in Florida, citrus and horticultural officials there are scrambling to find programs to help citrus growers manage the disease. In Fort Pierce, scientists in the ARS Subtropical Plant Pathology Research Unit, led by Tim Gottwald, and the Subtropical Insects Research Unit, led by David Hall, are at work on a range of strategies. Their goal is to develop an integrated HLB management program using cultural, chemical, and biological control strategies. These will likely include removal of infected trees, special replant strategies, and active psyllid control. Epidemiological experiments testing different management components are under way to develop the integrated program. Formal sampling methods for monitoring the psyllid are being developed as well. Biological controls will also be investigated. The psyllid is subject to natural control by lady beetles, syrphid flies, lacewings, spiders, and one parasitoid wasp species, Tamarixia radiata. Another parasitoid species is known to attack the psyllid in Asia, and ARS is considering importing it for testing and release. New technologies are being investigated. For example, Gottwald is examining use of hyperspectral radiometry to detect presymptomatic HLB-infected trees. He is also examining unique volatile compounds given off by HLB-infected trees that might be used as a means of detection. Hall and his staff of entomologists are studying the psyllid’s reproductive biology and behavior in their search for management ideas. For instance, they’re exploring whether the psyllid emits pheromones that could be useful in detection and control. Gottwald and Hall’s group is pursuing an especially intriguing approach to thwarting leaf-feeding Asian citrus psyllids: creating citrus trees that are partially deciduous during some periods of the year. “Psyllids need leaves to feed on and reproduce,” says Hall. “If you don’t have leaves, you don’t have psyllids—simple as that.”—By Alfredo Flores, Agricultural Research Service Information Staff. David G. Hall and Timothy R. Gottwald are at the USDA-ARS U.S. Horticultural Research Laboratory, 2001 South Rock Rd., Fort Pierce, FL 34945; phone (772) 462-5800, fax (772) 462-5986. "Curbing a Psyllid To Help Protect Citrus" was published in the February 2007 issue of Agricultural Research magazine.